Why do I like it - it's extremely pigmented - a little goes a very very long way with this. It's water resistant. It doesn't crease. It doesn't fade. It doesn't bunch. It doesn't settle into fine lines. It works under the eye. It works as a blemish concealer. It seems to work on dry and oilier skin (so far). It doesn't even need powdering. It's fragrance free. Paraben free. Alcohol free. It's possibly the concealer-to-end-all-concealer-searches. My previous hitherto-used-without-a-blink concealer palette is looking in danger of not being replaced (not that it needs it, anytime soon, but how and ever). It's a water-and-silicone based formulation. It contains a teeny tiny amount of bismuth oxychloride, which means it's great for brightening up under the eyes. I haven't found it to flash back. 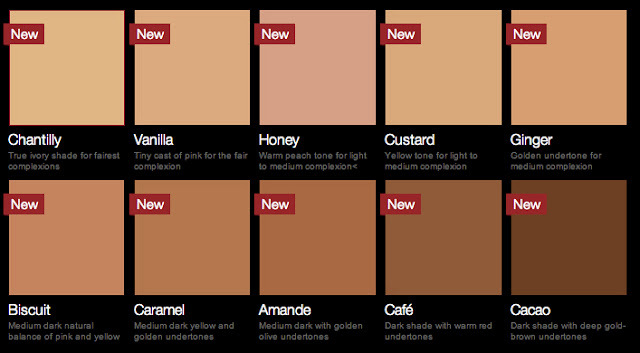 In terms of shades, these don't necessarily come in cool- or warm- undertones, like many other concealers (look here and here for some more information on concealers and correctors and here for information on all of the MAC concealers available), rather they mirrors some of the NARS foundation shades (which is a good and a bad idea in my mind), and there will be ten shades, ranging from a reasonably light shade to a reasonably dark shade. A few minutes swatching one on-counter should net you a shade you need for your purposes. Demonstrably absent is an ochre shade, but then again these are concealers, not correctors - it just so happens that some can double-up nicely as both. For example, I bought just one to try it out - in shade Honey, which is a peachy coloured one, great for cancelling-out blueness in under-eye dark circles then. One step, replacing my previous correct-conceal-highlight-powder routine. In terms of coverage, this is a medium-buildable-to-almost-full coverage concealer. Downsides? Doe-foot applicator; I hate these things, they're unsanitary. Price-wise I think this was around the €26 mark as I recall - not crazy expensive, not crazy cheap. I would certainly not hesitate to pay this, as it works so well, and is the first product I've ever used that fully replaces the need for both corrector and concealer. In addition, as I don't need to correct, conceal, highlight, then powder, it's a major timesaver. Look here if you want more information or to buy online. Would usually pause for a sec before recommending something that bit mroe expensive but hell yeah this stuff is amazing! Ooh I've wanted this for ages then read some bad reviews and put it off, now I want it again!! Interesting to hear your take on it, genuinely. Can I ask if you use an eye cream/primer first? I agree with you that it dries down quickly enough and is quite a dry formulation, so if you have very dry under-eye area I could see where there might be a problem... that's just what I've seen of it so far anyhow, obv everyone's skin is different.